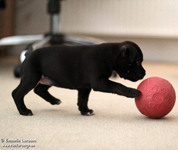 We expect that you know the basic about the breed and what it means to own a Staffordshire Bull Terrier before contacting us to sign up for a puppy. Furthermore we would like to know a little about who you are, what experience you have with dogs? What expectations you have to us? 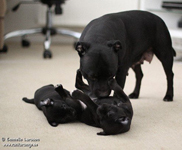 What thoughts have you made in connection with the ownership of a staffie - Shows, Training, Breeding etc.? 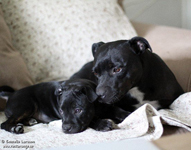 Our dogs means the world to us and therefore it is important that our puppies come out in good and stable home for families who know what they are dealing with. Breeders have a responsibility not only towards their own puppy buyers but also indeed to the breed. This responsibility we take seriously and we are always available to our puppy buyers regardless of what it might be. We believe it is important to have good contact with our buyers so that we together can prevent and solve any possible problems. WE RESERVE THE RIGHT TO CHOOSE THE MOST SUITABLE BUYERS!